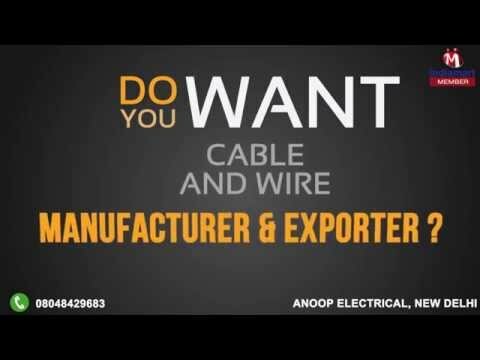 Anoop Electrical is a well known manufacturer and supplier of Multicore PVC Insulated Cables, Single Multi Core Cables, Flexible Cables, Digital Coaxial Cable and CCTV Cable. The extensive range of provided products under these categories are Multicore PVC Insulated Cables, Copper Control Cable, Flexible Cables, PVC Pipes and Solar Cable. These products are widely used and demanded for transmission of current in various industries. Our products are highly appreciated for their capacity, high strength, resistance to heat and shock proof among the clients. In addition, we offer istallation service of these products to achieve client satisfaction. We have full capacity with all facilities and developed technology and equipments to fullfil the assigned order. We always strictly analyse new developments prevailing in the market in order to give our best to the valuable patrons. We follow all the industry norms and policies to do business in an ethical manner.